Whether it was the result of magic, of enchantment, a miracle or whatever, the fact is that the town was born in the last quarter of the 19th century. Surveyors abruptly arrived from a large three-masted sailboat with pith helmets partially covering their noses, khaki shirts and shorts and rough high-top boots. They go down to the stream with their theodolites and marking poles, point their lenses, plant their stakes and throw lines of lime between and on the rocks. Then up they go to the rocky tables to do the same. Behind them are dozens and dozens of carpenters with bars and boards, nails, fittings, saws, brushes, chisels, squares, levels and the necessary materials to build the homes where Mexican miners and workers would live with their families, right there, in the middle of the canyon. They struggled and worked to complete the civic buildings in the center of the town. There was customs, the primary school, the kindergarten, the theater, the hotel, the market, the bakery, and the company store. 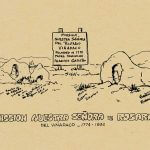 They then went up to the south table to build the simple houses of the Mexican employees. A rifle shot from here, on the north table, they raise, on an elevation overlooking the pebble beach where the dock and the smelter will soon be, the offices of the newly founded El Boleo Company. From the portico entrance, you can see the mansions of the officials, the hospital and the French hotel. All the houses will have a porch. The lower classes will be short and narrow, the Europeans long and wide. However, on every porch the residents will suffer the same infernal sultriness of the summer afternoons. Did the French architects choose the right materials to build a town in these territories that boil in summer and are lashed by the biting winds of autumn-winter? Separated from the scree on pine stilts, the buildings have a smattering of insulation. Hot sheets of zinc on the roofs are tempered by the wood that the ships continue to bring from the sawmills of that Washington that has been settled by manifest destiny and the conquest of the West and is already a supplier of our industries. Like the houses and the civic buildings, the engineers make the workers lift with cranes, hoists, winches, cables and a thousand tricks, the steel beams on which they will rest the plates that hold the foundry furnaces and the gigantic Swiss electric generator. It will give light and power to telephones and the German funicular of baskets transporting ore, and to workshops with their turning machines that mill, cut, brush, grind and do whatever you want and need, because Europe is a distant horizon and here you must make your own parts. 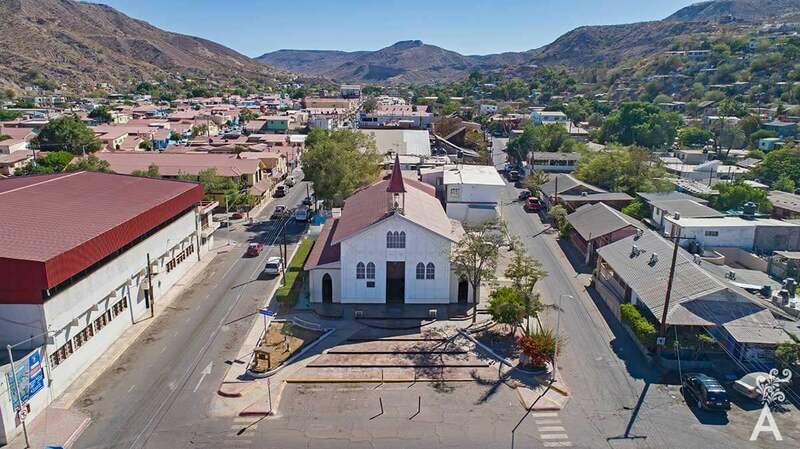 In two magical winks, the layout of the town is finished, and the wood and iron construction continue an incessant rhythm, while Yaqui excavators, Chinese and other miners brought from the Mexican counter-coast and from various countries drill with pick, chisel and shovel. Copper is removed from neighboring hills, a mineral of such high demand it can pay the expense of building – in two miraculous steps – a town in the middle of the wild California. Like ants, they lay down sleeping logs and build bridges over the ravines, where the narrow-gauge rails lead the trains with wagons loaded with copper and manganese from Purgatorio, Santa Marta, Providencia. They feed the kilns from which red plates are formed and stacked in the holds of the ships. Twenty years have passed after the fifty that Don Porfirio granted to the Rothschilds to come and develop. Like the sweat and blood and lungs of the ghosts that run through the galleries, the veins of copper are exhausted, and the French returned to their land, leaving here their seed, a broken industry, beautiful buildings and a magic town. The brave ones stay. Cachania survives. 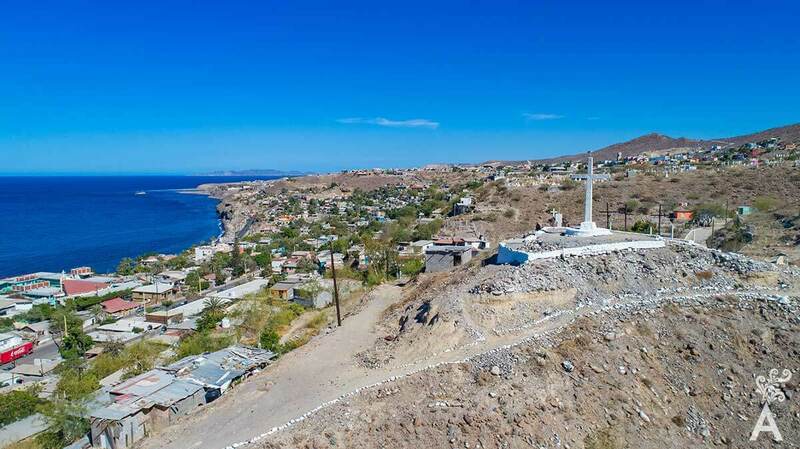 “Cachania” is not a nickname for Santa Rosalia as some suppose, but an “affectionate” family noun the residents have given to this mining town on the Gulf of California, an important producer of copper at the beginning of the 20th century.